Saunders is using Smore newsletters to spread the word online. The first trimester is in the books, and the second is underway! Winter break is rapidly approaching and the Winter Concerts are only a week away. Where, exactly, did autumn go..? We have a busy month, so I wanted to take a moment to fill you in on what's been happening in 5-S. As always, please feel free to contact me anytime with questions, concerns, or suggestions you may have. 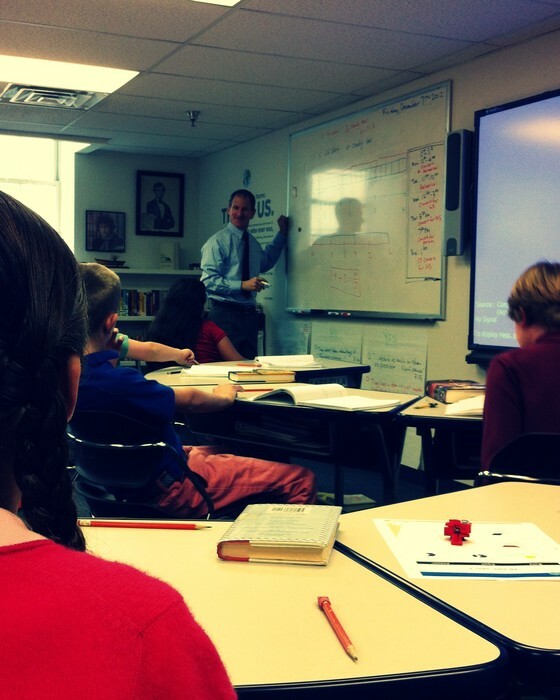 Dr. Richard Bisk visited GCDS this week, and spent some time in our class discussing fractions, bar modeling, and the importance of conceptual understanding. He was very impressed with our students, and left them with a challenge. Ask your student to show you the problem! Our BFF Program continues to be a big success. Over the past month, we've met with our Upper School peer leaders once a week to share, question, and discuss issues of bullying, teasing, and joking. We hope these conversations are helpful to our students as they continue to navigate their increasingly complicated social worlds.